Is A Busy Brides Friend! There is a company I have been recommending to brides who want wedding dress preservation services. 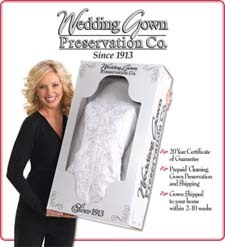 I recommend to them to use the Wedding Gown Preservation Company! They provide both wedding dress cleaning and the preserving of your dress. I have been an "authorized dealer" for the past 10 years! But before becoming a representative I looked into using a couple of other companies. Now I have to admit... there was another company I came close to using. It had the endorsements of some famous designers and historical preservation experts in it's advertising. Special Note: If you are trying to figure out whether you need to preserve your wedding gown.... there is a reason you should do so. Read more about this here. The other company had a few resolved complaints, which wasn't bad for a business that has been around a long time. But the Wedding Gown Preservation Company had none. "That is remarkable as far as I am concerned!" The Company has been around since 1913. And it serves brides nationwide. Why is this important? I see gowns that have been preserved come to me with some little staining or spotting. Some are still under warranty, but cannot be sent back. Why? The company or cleaners that did it is no longer in business. "So you can see why it would behoove you to go with a company such as the Wedding Gown Preservation Company to preserve your dress!" 3.They Don't Vacuum Seal The Box"
Vacuum sealing has been found to not protect the garments from yellowing or deteriorating. In fact it can hastens this process. So I also liked the fact that this company do not vacuum seal the box. And they encourage you to look in the box each year (around your anniversary is a good time) to see if your gown has any stains or yellowing popping up. If you see something, as long as it is under warranty, you can send it back as many times as you need to. Hard to beat that! 5.They Make It So Convenient For You!" One big benefit I feel is the way the Wedding Gown Preservation Company package and market the preservation kits. They have you, the bride, in mind because they make it convenient for you to have your gown preserved. How? If you purchase a wedding gown preservation kit before your wedding, you can have your gown sent off by your mom or a friend while you are on your honeymoon! Or you can do this quickly and easily after you return. No running back to the bridal shop or the cleaners to take your dress! No dropping it off somewhere and then going back to pick up your wedding dress. "You box it up, ship it and it comes right to your door. One less thing to do and another task crossed off your list. Can't get any easier!" The brides who purchase their kits from me this way really appreciate the convenience. They know that if they don't do it before the wedding it will most likely get put off after the wedding until one day they forget about it completely. You will notice that the kit consists of a box, a plastic bag, stickers and a prepaid shipping label. You will also see an order form where you can, if you wish, purchase additional services or preserve additional items from the company. So how do you package your gown to ship to the Wedding Gown Preservation Company? There will be instructions clearly depicting the steps on how to package your gown and have it ready to ship, included in the kit. First tape the box together. Place stickers on the gown and identify the stains so that they can be treated. Place the dress in the plastic bag and place in the box. Fill out shipping invoice and seal. Place on prepaid shipping label. Now wait 2 to 10 weeks for delivery to your door all packaged and boxed securely! That's pretty simple isn't it? Special Tip: When labeling the stains on your dress don't forget to note if any champagne spills on your dress. Champagne dries clear and with age turns brown. This type of stain has to be treated so that this doesn't pop up later after it is preserved. So make sure to note where the stain is on the dress since it probably won't be visible. So what does this cost? It normally retails for $179.00 on up for the Traditional Line Preservation. Your gown will be cleaned and preserved for this price!!! That's about what some cleaners charge just to clean a wedding gown! Contact me if you want to purchase a Kit. If you want a little more information, go to their site Wedding Gown Preservation Company.